Jamie McGoldrick, second from left, the UN Deputy Special Coordinator for the Middle East Peace Process and the Humanitarian Coordinator for the Occupied Palestinian Territory, visits a patient at the Al Quds Hospital in Gaza (file). Supplies of emergency fuel provided by the United Nations for critical facilities in Gaza are being fast depleted, a senior UN relief official there warned on Sunday. “At least one hospital has been forced to shut down for a few hours, and services are being dramatically reduced at others,” said Jamie McGoldrick, the Humanitarian Coordinator for the Occupied Palestinian Territory. The humanitarian situation in Gaza – controlled by Hamas, a militant Palestinian faction – has been negatively impacted by a blockade of the enclave imposed by Israel. According to the World Health Organization (WHO), Al Quds Hospital, which provides life-saving medical interventions for 150,000 people per year, including major surgeries, deliveries and intensive care will be forced to shut down in coming days due to lack of fuel. Four other hospitals are likely to run out of fuel within the next three days, thus significantly reducing the provision of essential medical services to the population in Gaza. Elective surgeries are being further reduced. Over 7,000 elective surgeries have been postponed in recent months due to the mass trauma casualties and low resources available to cope with the demand. At highest risk, currently, are over 2,000 patients in Gaza’s hospitals, who rely on electrical devices, including neonates in incubators. Over 1.27 million people would be directly affected by hospital closures and a reduction in the provision of vital health interventions. Additionally, the reduced functioning of water and sanitation facilities risks an increase in waterborne disease and outbreaks. An average of 950,000 litres is distributed by the UN each month to around 220 critical hospitals and health clinics; water and sewage treatment sites; and solid waste collection services. 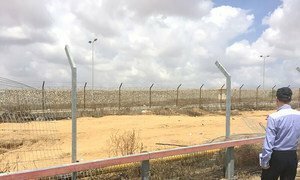 Voicing deep concern over the latest flare-up of violence around Gaza, the United Nations chief on Saturday urged all sides to “step back from the brink of another devastating conflict”.